Junior District Attorney is a crime prevention and educational program designed to provide middle school students with an overview of the criminal justice system by allowing them to observe its actual operation. The program accepts rising seventh and eighth grade students from selected Atlanta and Fulton County public schools. The students meet twice weekly for four weeks during the summer and are exposed to various components of the criminal justice system. They also have an opportunity to meet and interact with government officials throughout the county. The goal of the program is to provide students with a basic understanding of the criminal justice system. Upon entry into the program, students are given a signature navy blazer and are asked to abide by the Junior DA creed. 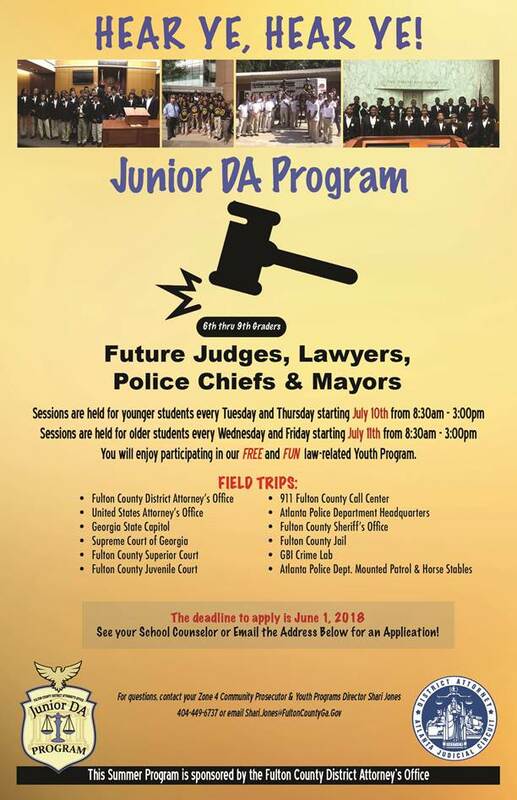 Junior DA activities include observing trial preparation, viewing courtroom proceedings, and educational field trips to the Georgia Supreme Court, the State Capitol and various law enforcement agencies. The highlight of the summer program for many students is the opportunity to appear as featured guests on CNN’s Nancy Grace Show, hosted by Grace, a former Fulton County Assistant District Attorney. The program culminates in a graduation ceremony and reception where the students are pinned with a special DA badge which they proudly affix to their Junior DA blazers. In the summer of 2011, the program garnered national attention due the heroic acts of one of its students. Taking cues from a forensics class she had just taken with her Junior DA classmates, Jessica Maple solved the burglary of her great-grandmother’s home in Fitzgerald, Georgia. Her actions generated media buzz because Jessica, then just 12-years old, beat police to the punch. Jessica traveled to the South Georgia home which had been ransacked by criminals and left devoid of furniture and appliances. Following her instincts, Jessica went to a local pawn shop where she discovered her grandmother’s belongings had been sold. She asked the pawn shop owner for copies of sellers’ id’s and then called police to inform them that she had not only recovered her family’s stolen property, but tracked down the suspects as well. Jessica and her mother, in a brazen move, confronted one of the suspected burglars about the theft. He was later arrested. Jessica’s courageous acts were first reported by a local television station. The very next day following the broadcast Jessica was bombarded with requests from national television, print and electronic media outlets. She has since received several awards including the District Attorney’s annual ‘Voice for Victims’ award given to citizens who sacrifice their lives or personal safety for the benefit of crime victims or those in danger.